Sadness, acute and enduring, lines the face of a man whose portrait Albert Alcalay drew in 1942 while imprisoned in the Ferramonti concentration camp in Italy. Mr. Alcalay titled the drawing "A man who lost his whole family." "The artist draws this imagery - uncanny, mysterious, sometimes unpredictable, and sometimes indecipherable - from the well of archetypes, from the deep and profound abyss of his being," he wrote in "The Persistence of Hope," a memoir of surviving the Holocaust that was published last year. The often brooding drawings from wartime that punctuate the pages of his memoir gave way to buoyant abstract expressionist paintings that made Mr. Alcalay's name as an artist when he moved to Boston in the early 1950s and spent more than a half century filling canvases with vibrant colors. Mr. Alcalay, who taught at Harvard for many years and whose work has been shown or is in the collections of places such as the Museum of Fine Arts in Boston and New York's Whitney Museum and Museum of Modern Art, died in Beth Israel Deaconess Medical Center on March 29 of complications from an infection. He was 90 and had lived in Brookline. "Color is a part of my circulation. I think I would use red even if I were on the North Pole and everything is white," he told the Globe in 2004. "It's part of me, part of my blood. I'm an optimistic guy. I see the world from a red point of view, not a blue point of view." His talent, meanwhile, ranged across a spectrum of creativity. One retrospective at Harvard's Carpenter Center for the Visual Arts included Mr. Alcalay's drawings, oil paintings, prints, sculptures, and watercolors. Globe critic Robert Taylor, who reviewed the show, called Mr. Alcalay's art "jubilant." Noting that one of the artist's "principal themes is the energy of the modern city," he called Mr. Alcalay "a landscapist. Instead of the twitching movements of people moving through nocturnal streets in the manner of the marionettes of a silent movie, his work presents a jetstream vision moving across urban terrain at a high altitude, watching the landscape spread out, rotate and recede. The velocity is terrific, and one shape melts into another, but we never lose a sense of an actual place." As Mr. Alcalay worked in the third-floor studio of his Brookline home, "the music was always going on," said his wife, Vera, whom he married in 1950 after they met in Rome. A painting, she said, "would happen - it would just happen" sometimes in as little time as 20 minutes, though often much longer. Each piece brought Mr. Alcalay face to face with himself, he said four years ago in an interview for the Harvard University Gazette. "You paint and paint and paint," Mr. Alcalay told the Gazette, "and eventually there comes a time when the painting looks back at you and says, 'Hey, this is you!' "
An architecture student before World War II, he had traveled to Paris and familiarized himself with modernist schools of painting. "He liked to call himself an abstract expressionist," his wife said. "And I always felt obliged to tell people, 'Well, he actually knows how to draw,' because you can get away with anything with abstract expressionism." Born in Paris, he grew up in Belgrade and his mastery of languages mirrored his facility with different approaches to the visual arts. "My mother tongue was Serbian," he wrote in his book. "I was trained in French in my youth and, during the war and critical years of my formation as an artist, I learned Italian. But I set this story down in English, the language of the land that has become my adopted home and the mother tongue of my posterity." While interned at the Ferramonti camp with his family and other Jews, he studied with another prisoner, the German expressionist painter Michael Fingesten. Mr. Alcalay wrote that he traded jars of marmalade he had received from the Red Cross for lessons, and reluctantly had to converse with Fingesten in German, "that detested language." In his book, Mr. Alcalay recounts how he fought with the resistance during World War II, was captured and beaten by the Nazis. He talked his way out of some situations and escaped from others. Near the end of the war, he and his family hid in the mountains of Italy. Vera Alcalay said that after the couple married, it was her suggestion that they move to Boston. Mr. Alcalay's first solo show in Boston was in 1952, at the Swetzoff Gallery. He began teaching at Harvard in 1960 and retired in 1982. 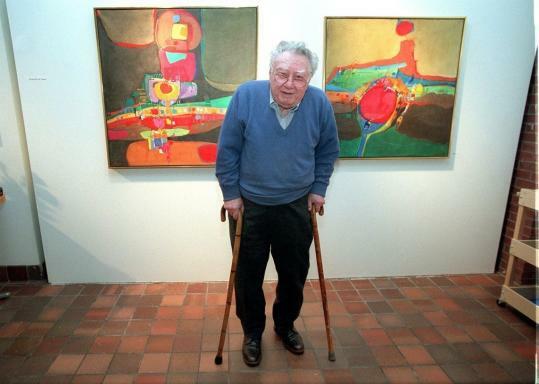 He also was a visiting professor at the University of Maryland and taught students privately in his Brookline studio. And a few years ago, he was the subject of a documentary, "Albert Alcalay: Self Portraits." With age came macular degeneration. As his sight diminished, he found different ways to keep creating. "I don't see very well," he told the Globe in 2004. "My way of painting is that I invented a garden, and mostly I paint from my garden, images from my garden." Because the limits of his eyesight did not allow him to visually embrace the large canvases that accommodated his oil paintings, his wife said, he switched to watercolors on a smaller scale. "The latest work, I named it post-macular," she said. At 59, Mr. Alcalay wrote in his book, he began to capture his memories in words, recounting the years he had survived during World War II. "In recent years . . . I have become more fully aware of the ultimate closing of the circle of life," he wrote. "Before the horizons of my memory grow dim in the twilight of advancing age, I have turned the light of my spirit to reflect on the past. . . . Now, as the sun hangs low on the western horizon of my life, I cast its light to the east across an ocean and a gulf of time, with the hope that it will illuminate a past that is quickly receding but should never be forgotten." In addition to his wife, Mr. Alcalay leaves two sons, Leor of Brookline and Ammiel of Brooklyn, N.Y.; a sister, Buena Alcalay Pearlman of Newton Center; two grandsons and a granddaughter.